... a real highlight was McAteer’s heartwarming lullaby-like aria accompanied by Elizabeth Field on violin... The duet “Gott du hast es wohl gefuget,” with McAteer's lovely soprano and Nomura's rich basso, was a highlight, accompanied as it was by a stellar, marathon obbligato by Watt. After the interval we got two early Bach cantatas; Christ lag in Todesbanden and Der Herr denket an uns, with Ellen McAteer, Simon Honeyman, Nils Brown and Joel Allison as soloists... Lovely singing again here with a particularly touching solo from Ellen in Der Herr denket an uns. ​with soprano Lara Secord-Haid and Martin Achrainer! Christmas with the Big Soul Project! Ellen was the recipient of the Jeune Espoir Lyrique Canadien 2017 prize and was chosen as a National Finalist for the Voix Nouvelles 2018 Competition. Ellen has also been invited to complete training, auditions and concerts at Staatstheater Mainz (Germany), Theater Regensburg (Germany), Theater Nordhausen (Germany), Staatstheater Nürnberg (Braveria) and Landestheater Linz (Austria). "A mellow secco recitative by Lichti followed by Bach’s touching fourth movement, Komm in mein Herzenshaus (Come into my heart’s house), a tender soprano aria poignantly sung by Ellen McAteer brought us to the midpoint of the cantata, Bach’s long lines of twining melisma traced with superb finesse. Cello accompaniment by Margaret Jordan-Gay supported by Matthew Larkin’s gentle chamber organ enchanted." "Ellen McAteer whom I last heard in Opera Atelier’s Dido and Aneas, was stunning in her aria “Er kommt…” portraying the desperation of seeing Judas about to betray Jesus." "If you have any curiosity about this work, if you have the desire to hear good singing & playing, you must take advantage of the opportunity in May... The sopranos McAteer and Zsigovics soar gloriously throughout the afternoon both from the chorus, and then emerging for their own solo fireworks." "Ellen offered up three selections from the Canteloube Chants d’Auvergne; L’aio de rotso, Baïlèro and Lou coucut. I think it’s quite bold to offer up such well known fare, especially when it’s so often been used by very famous sopranos to show off the sheer beauty of their voices. Frankly Ellen didn’t disappoint in that department with a haunting Baïlèro and then she cut loose with an unrestrained and very effective Lou coucut." Before a well-deserved encore (duet from Rodelinda), Daniel Taylor noted how wonderful it is “that in these difficult times we can come together like this,” sharing in such sublime music. Duly noted by the standing ovation, so well deserved for all these marvelous musicians." "Then followed the Oratorio’s famous “Echo Aria,” which showcased our radiant soprano soloist, Ellen McAteer... I have been long on the record in admiration of Ellen’s singing. A danger of the more recent style of baroque soprano singing is a sort of wan, skeletal sound in the lower register, for which we will make excuses, because it usually is an indication of a sort of chant du rossignol upper register: extremely agreeable in its sweet and flutey sound. With Ellen, no compromise is necessary. Her voice is powerful, colorful, and full of shimmery overtones from her lowest to highest notes, and her singing here was immensely rewarding." 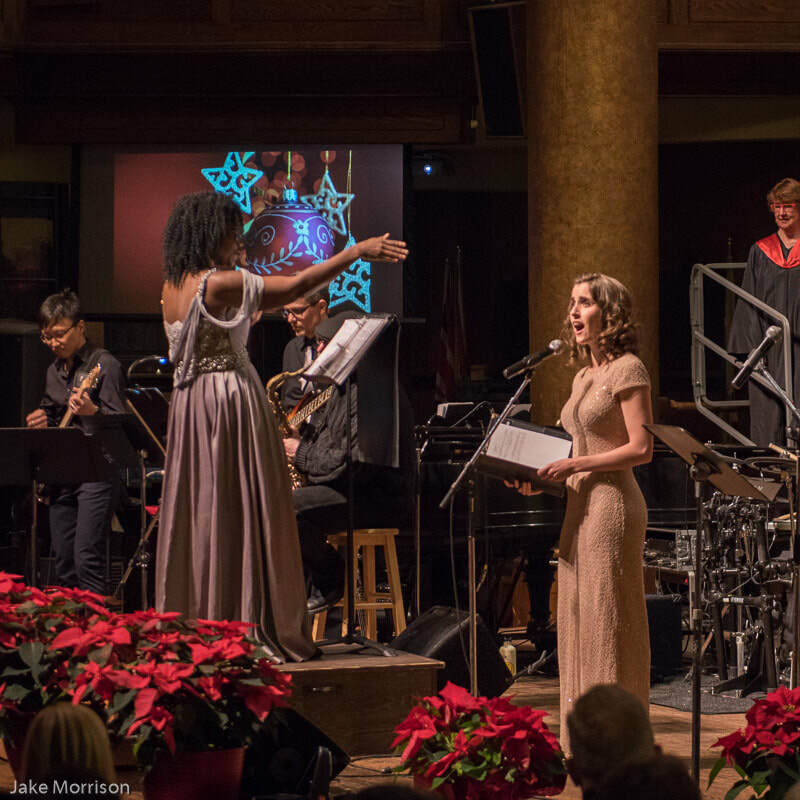 "Ellen McAteer shone with her brilliant, clear soprano..."
"Adorned with soaring melisma, the final pre-intermission offering, Tenebrae (“Darkness”), evokes a host of influences in Golijov’s assessment, Catholic Holy Week to illuminated medieval manuscripts to NASA earth photos. 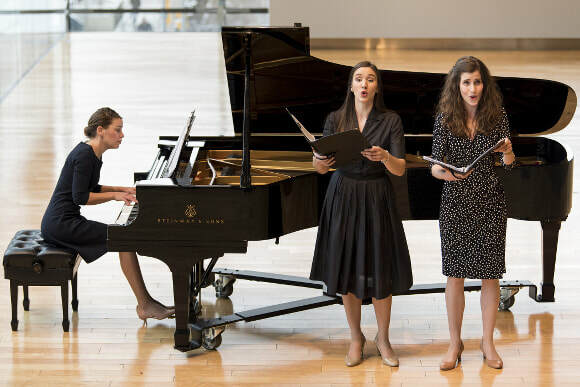 A single voice, here lyric soprano Ellen McAteer, recites a simple series of six consecutive Hebrew letters casting a strangely mystical spell while the fine student ensemble led by violinist Barry Shiffman weaves a tapestry of ornate harmonies." "The members of the Glenn Gould Ensemble played all three with verve, passion and commitment. Sopranos Adanya Dunn and Ellen McAteer both inhabited the sweet, passionate world of Golijov’s writing for voice with real conviction." "In Tenebrae, soprano Ellen McAteer and clarinetist Brad Cherwin, augmented by the quartet, took us from the lush darkness of the first movement to the tonal comfort of the second, on the composer’s sojourn to the solace of Yerushalem." "Tenebrae was next, featuring the quartet with soprano Ellen McAteer and Brad Cherwin on clarinet. This piece saw the vocals and clarinet basically singing a duet with each other; Cherwin's clarinet sound blended seamlessly with McAteer's rich soprano to the point where I thought at times the clarinet was producing the consonants. In this piece, you felt less like it was a piece for "voice and small ensemble" and more "sextet where one instrument is a human voice" and it was the perfect way to cap off the first half." "McAteer’s steely soprano handles Purcell’s fussy lines with sparkling agility." "​As her two witches, sopranos Ellen McAteer and Karine White stole the show. Their sparkling, yet sizeable voices, blended seamlessly and their physicalizations were top-notch. Funny, but not distracting and set you up perfectly for the doom of Dido to come shortly after. I was particularly taken with McAteer onstage. She managed to add a small bit of contemporary flair into her stylized physicality that both heightened the humour and her position next to the Sorceress. Brava. Also, that laughing duet where they sing "Eliza's ruined," was possibly the best I've ever heard it sung." "Those witches were great – Laura Pudwell, as the chief conjurer, sort of the Bette Midler character in Hocus Pocus, with Ellen McAteer and Karine White as her whirling, devilish, irrepressible posse." "Ellen McAteer as the First Witch made the most of her brief moments to shine." "As Lucretia's nurse, Bianca, and her maid Lucia, mezzo-soprano Beste Kalender and soprano Ellen McAteer (respectively) gave probably my favourite singing of the night. As a comprimario performer, I'm a sucker for great ensemble singing, and these two sounded like they've been making music together their whole life. Kalender's rich, active, smooth mezzo and McAteer's twinkling soprano were a match made in heaven. I particularly enjoyed the way McAteer was able to finesse the musical lines to bring out more of the comedy inherent in the maid's character - something that this piece really needs to let the audience breathe for a moment during all the stress." "[Ellen McAteer was] genuinely youthful and impetuous"
"[Ellen] gave a very accomplished and rather intense account of three songs from Schumann’s Frauenliebe und -leben.She also popped up later in the show with aptly fierce accounts of Ville and Royauté from Britten’s Les Illuminations. The Britten was a bold choice brought off with skill and with equally accomplished work by Madeleine Christie at the piano." 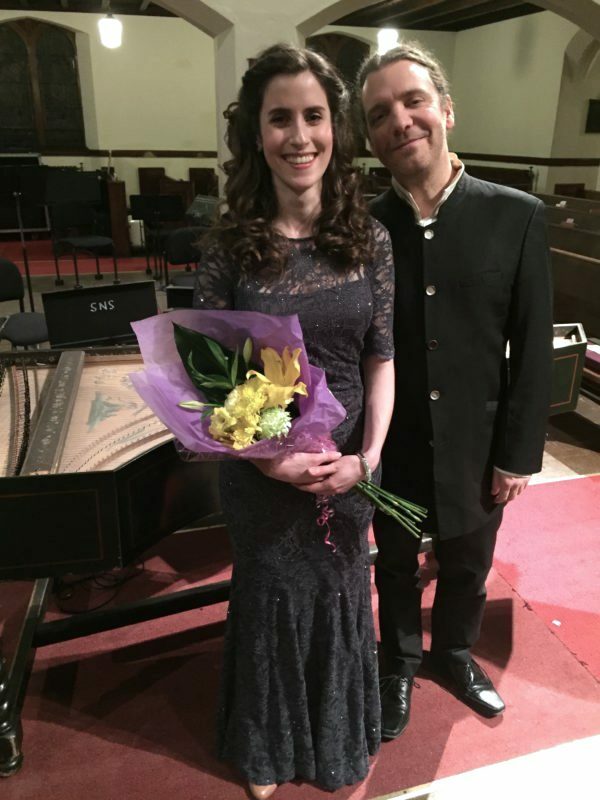 "The final participant was lyric soprano Ellen McAteer... Hers is a lovely lyric soprano of good volume and sheen... McAteer sang [Britten's Villes] well, brimming with energy." "Soprano Ellen McAteer ... [sang] with fresh, youthful tone. Her best was the soft, radiantly sung “Du Ring an meinem Finger.”"
"Dido dominates here and was sung for maximum fierceness and emotional impact by Ellen McAteer." "But perhaps the most impressionable music that Mr. Rolfe composed was for Ellen McAteer’s stunning Lola... It is fair to state that Ms. McAteer was an audience favourite. Ms. McAteer’s Lola was a powerhouse of dramatic assuredness, the ultimate in vulnerable intensity, but always commanding felicitously high timbre in her tone all night... Her atonal cabaletta in Act II, followed by a stunning virtuoso Elektra-like ecstasy was among the most brilliant compositional moments and the most stupendous singing of the night. It was the perfect marriage of musical construction, dramaturgy and theatricality and it stayed with me for many days after the show ended." "... As one of Donna's eventual love interests (one of many), Ellen McAteer was stunning as Lola, a fusion of Donna Elvira's vulnerability and Zerlina's innocence. Universally admired, McAteer braved Rolfe's challenging score with virtuoso daring, and her eloquently played characterization, especially in her Act II cabaletta, became the hinging point of success for the entire opera." "Tiridate's minister, Tigrane was beautifully sung by soprano Ellen McAteer." "The radiant joy and ebullient charm of Ellen McAteer and David Newman in their duet, Herr, Dein Mitlied, was elevating and beguiling." "Ellen McAteer’s singing [was] amazing... the size, color, and agility of her voice ﻿are﻿ unusual in early music circles, and her performance of Bereite dir from BWV 147 is my new reference. 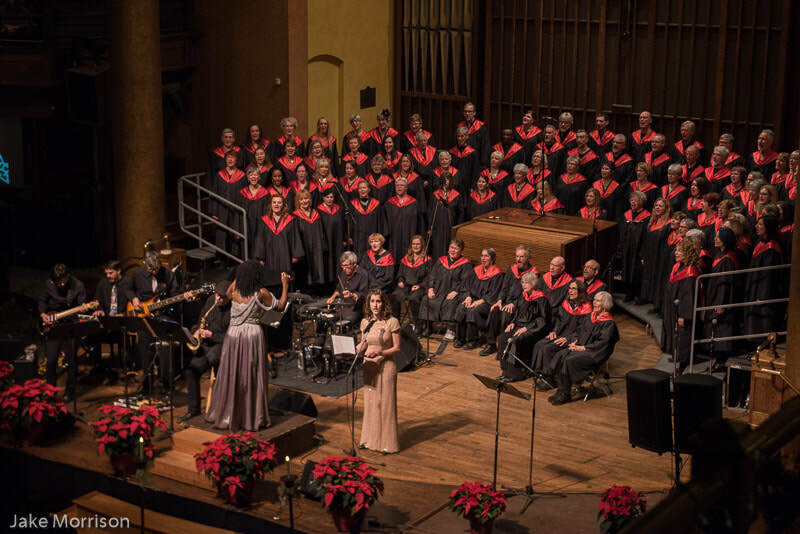 We’ve been so lucky to hear some amazing sopranos in Bethlehem, and it’s a sheer delight to number her among them, especially at this early point in a very promising career."